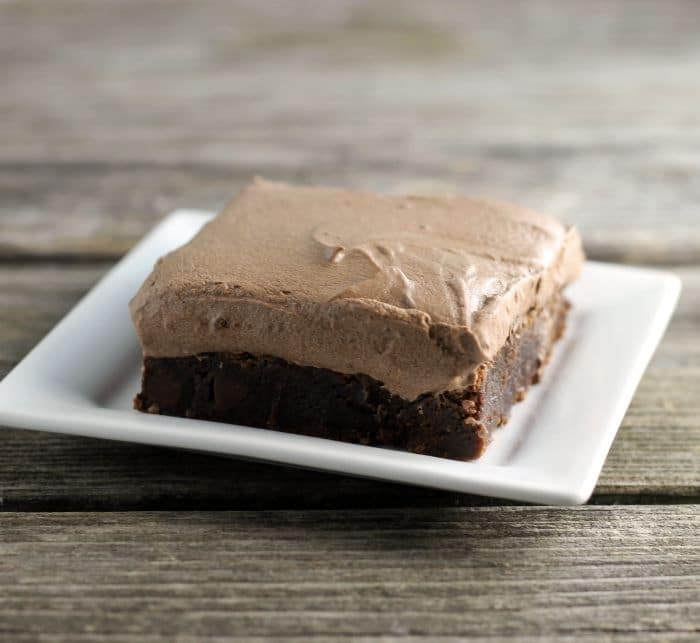 Easy Fudgy Brownies are a dense, fudgy, chocolaty, oh what the heck they are heavenly for a chocolate lover like me or maybe you. Easy fudgy brownies are the ultimate fudge brownie they even include chocolate chips in the batter. Totally dense and chewy brownies you are sure to fall in love with them. I don’t think that I ever met a brownie that I didn’t love. I grew in a family that adores chocolate. If you would come to one of our family get together you would see that our desserts are usually chocolate something or other. If it is possible I think that the chocolate love thing may be in my genes passed down through the generations. 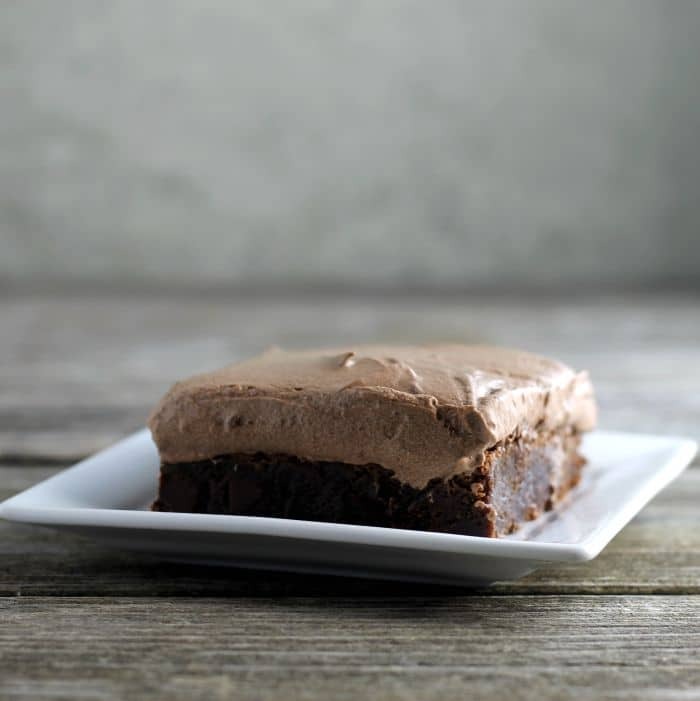 These easy fudgy brownies are pure heaven in my book as they are but I took it step further with this chocolate butter frosting. It’s a frosting that my mom made when I was a kid. It is actually a vanilla frosting, but I decided that it would not hurt to throw in a bit more chocolate into the mix. The frosting is light and fluffy almost like a mousse. It definitely takes these brownies over the top. The brownies are dense and chewy and did I mention that they are made with simple ingredients that you probably have in your kitchen right now as I typing this. That is always an awesome thing. I hate it when I find a recipe that I am dying to make and I don’t have all the ingredients. Make sure that you make these brownies when you have people around so that you can share or you may want to eat the whole pan by yourself. I make sure to make my chocolate recipes when my kids are visiting just for that reason. In a small saucepan add the butter and semi sweet chocolate chips. Over medium low heat melt the two ingredients stirring often. Once melted cool slightly. In a medium bowl combine the melted chocolate and sugar and mix with an electric mixer. Beat in the eggs one at a time. Mix in the vanilla. Add the flour and mix in until blended. Fold in the 1/2 cup milk chocolate chips. Pour the brownie batter into the prepared baking pan. Place in the preheated oven. Bake for 25 to 30 minutes. Remove from the oven and cool completely on a cooling rack. While the brownies are cooling whip up the frosting. In a small sauce pan combine the milk and the 2 1/2 tablespoons of flour. Over medium low heat cook until the ingredients thicken stirring during this process. Remove from the heat and transfer the mixture to a medium mixing bowl. Once the mixture is cooled add the butter, sugar, and cocoa, beat with an electric mixer until fluffy about 2 to 5 minutes. Add the vanilla and mix in. Frost the cooled brownies and enjoy. That looks sinfully decadent and bet it’s addictive too! What a great tip! I would never dare to make and store these in my house all alone. To tempting. Perfect for all the upcoming holiday gatherings thought! My entire family is chocoholics so…..these will go fast! 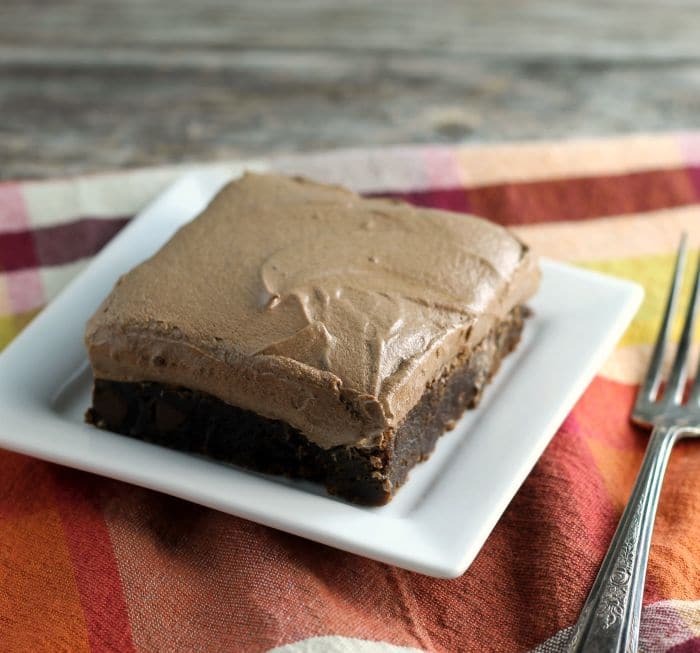 Fudgy brownies with a mousse-like frosting??? Count me and my chocolate loving family in on these!!! Haha! I don’t think I’ve ever met a brownie I didn’t like, either, Dawn! And from the looks of ’em, I’m pretty sure I would love these brownies. 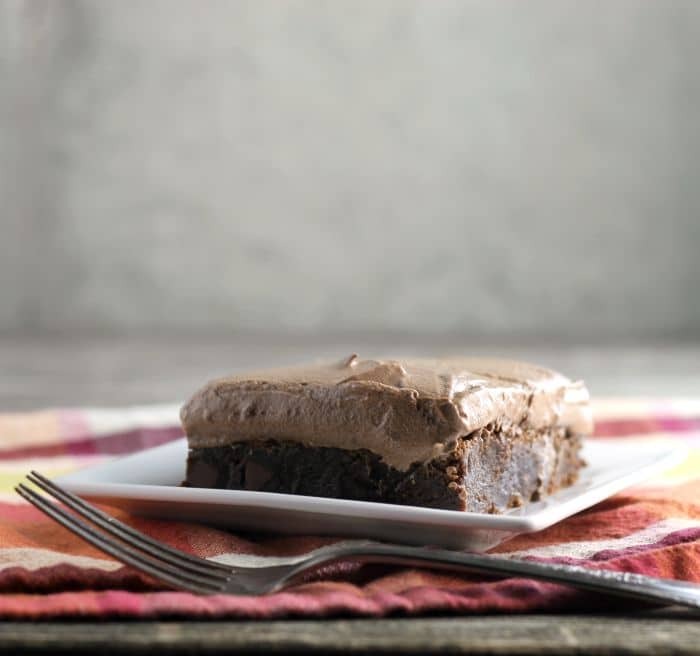 That light frosting on top really takes the cake…err, brownie! And, yes, I can see why you need a crowd around before making these. I would eat the whole pan by myself!